Solar controller is used in solar power system, is to control the solar cell array to charge the battery and the battery to the solar inverter load power supply automatic control equipment. So what is double charging? Dual rechargeable solar controller and what function? 1. Increase the charging current, compared to the traditional PWM controller, MPPT charging efficiency can be increased by 10-30%. (Controller conversion efficiency> 95%). 2 can be selected by DIP switch 4 batteries. GEL batteries, lead-acid batteries, AGM2 batteries, lithium iron phosphate batteries. 3. 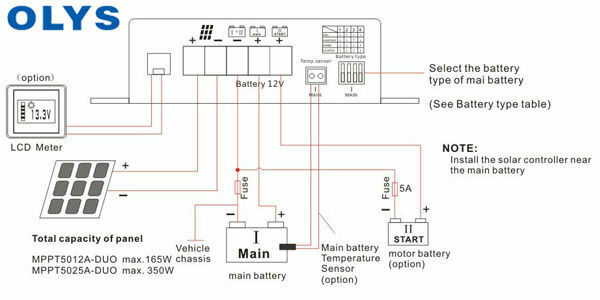 Two charging interfaces, which can automatically charge the main battery of the solar energy equipment, and also can charge the starting battery of the vehicle with over-voltage protection function. 4. Automatic unattended charging. With overload, overheating, reverse current protection (cloudy or no sunlight at night, to prevent the battery back to the solar panel). 5. Overcharge protection. When the battery is full, the charging current will be reduced, when the battery is dead, it will immediately charge the battery. 6. Automatic temperature compensation. Ensure that the battery in the low temperature or high temperature environment, the use of the best power supply parameters to extend the life of the battery It is strongly recommended not to install the battery and controller in the place of heat, so as to avoid controller error. 2. Solar panel power try to use the controller's maximum rated power. 3. The diameter of the connecting cable refers to the factory recommended value. If the cable is too small, it can lead to cable overheating and energy loss. 4. Install a rated-size fuse near the battery terminal to protect the battery between the battery and the solar panel. 5. Please install in a well-ventilated room to prevent rain, humidity, dust, aggressive battery gas and no condensation in the environment. 6 when the machine is sold, do not deserve any accessories. If you need to change parts, please contact the supplier. 7. Keep the controller and battery away from children. Due to the curing characteristics of the internal lead plate of the battery, if the battery fails to be recharged in time, the capacity of the battery will be drastically reduced and irreversible. Please promptly to those who lack of battery charge battery, especially some old batteries, or use the battery in hot places. Otherwise it will affect the battery life. Please select a suitable installation location, to ensure that the battery dry and ventilated environment. Controller uses 12V battery, in order to prevent damage to the controller, when the battery voltage is about 15-16V, the controller stops working. When the battery voltage exceeds 15V when charging in any mode, charging will stop. When the controller charging temperature is too high, or the ambient temperature is too hot, the controller into protection mode, stop charging. Because of the line loss, if you want to measure the voltage of the battery, you must measure the two sections of the battery directly, not the terminals of the battery connected to the controller. Solar panel current: 0 - 10 A 0 - 21.0 A. Maximum solar panel voltage: 50 V / 50 V.
Charging current: 0 - 12 A / 0 - 25.5 A. Charge return voltage: 12.7 V / 12.7 V.
Built-in fuse: 15 A / 30 A. The above information provided by the Shenzhen Olys Technology and Technology. 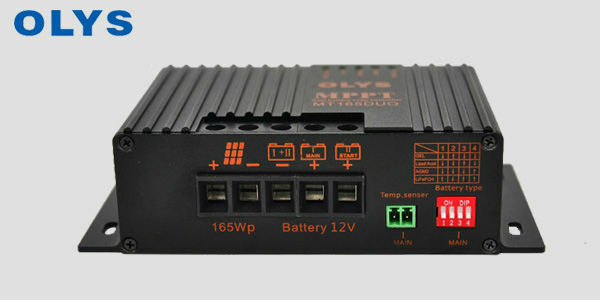 Shenzhen Olys Technology 12 years focused on the development and manufacture of solar controller, master the core of solar energy controller, cutting-edge technology, service more than 300 new energy companies.